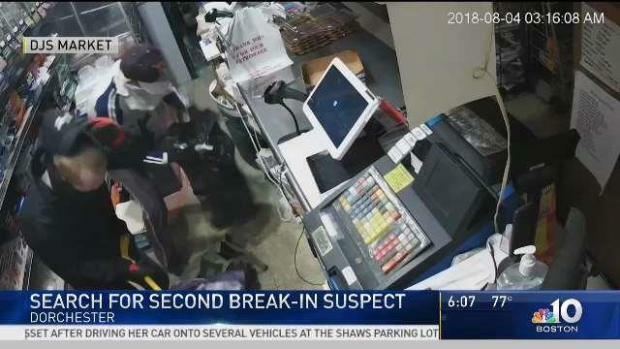 Police in Boston are trying to track down one of two thieves caught on surveillance camera, kicking down the door of a Dorchester convenience store, stealing several items, then taking off. Thanks to a dedicated father armed with a bat and filled with the urge to protect his daughter, police were able to arrest one of two robbery suspects who broke into a market in Dorchester on Saturday. "I was just like...so much rage," Dan Morris, owner of DJ's European Market, said. "You feel like you're being violated, our family is being violated." Morris' daughter, Dawn, was at the store when two men broke into the family business and began to ransack the counter. "As I was in the kitchen, I head like, a bang," Dawn said. "As I was running, I see a guy kicking in the door. I called my mom and I whispered to her, 'You know, someone's breaking in.' And so I hear my dad in the background being like, 'I'm coming.'" Boston police is looking for one of the two men involved in a robbery in a Dorchester market. Boston resident Thien Nguyen, 39, was charged with larceny and breaking and entering into the building after he and another man stole lottery tickets and cigarettes from the market. Surveillance cameras caught the suspect and a second thief kicking the market’s glass door until it shattered, allowing them to enter. Upon their escape, Dan exited from a truck and chased the thieves with a baseball bat. Dawn then hit a panic alarm and ran outside to flag down a nearby EMS worker. The worker was able to apprehend Nguyen until officers arrived. "Perfect timing because if it didn't play out the way it did, we probably wouldn't have caught the guy," Dan said. "If I wasn't here, they probably would have broken in, took more stuff and they would have gotten away, left and nothing would have happened." Dawn recalled the fright and concern she felt when her dad came to her rescue. "I'm scared," she said. "He's risking his life chasing these guys. I don't know if they have guns, knives." Officers found a black trash bag with lottery tickets and cigarettes near Nguyen at the time of his arrest. They are searching for the second thief who was seen robbing the market in the surveillance footage. 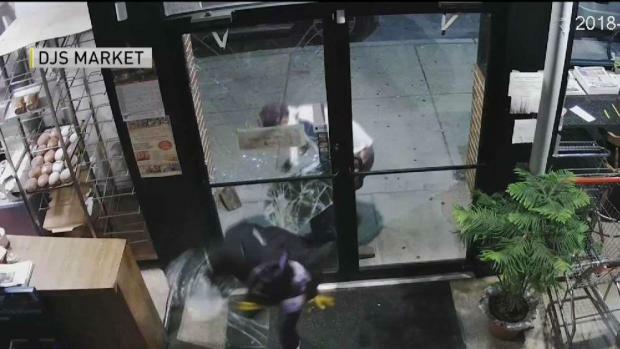 Two men can be seen on surveillance footage breaking into DJ's European market in Dorchester before a good Samaritan tracked down one of the suspects. "As scary as it was that I was in here, it's like if I wasn't here, my dad wouldn't come to help me," Dawn said. "If the EMT guy wasn't driving down the street at the same time, it's like, it all kind of worked out and it feels so much better that we caught someone." The family-owned business was broken into earlier in the summer, and the Morris family believes the same thieves are behind the previous robbery. The second thief is described as thin and stands at approximately 5 feet, 7 inches in height. He has light brown or red hair and was seen wearing dark-colored clothing, an Under Armour hat and red gloves. The thief was last seen running towards Harvest Street. Anyone with information on the robbery is asked to contact the Boston Police Department, District C-11 in Dorchester at 617-343-4330.